Tahoe Donner Home located on the Golf Course. Large picture windows overlook deck and the 16th fairway! Enjoy HOA amenities such as the Marina and Beach Club! HOA rec center features swimming pool, hot tub, fitness center, and more! Welcome to Fairway Family Cabin! 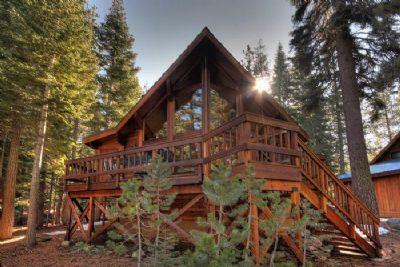 This adorable cabin is the perfect mountain getaway. Located right on the 16th fairway, it is quiet and peaceful, and comes with so many amenities! --Entry level: -Living room: 32" flat-screen TV/DVD player with full stereo system, quality furniture, DOUBLE sleeper sofa, real wood stove. -Dining room: seating for 12, with two additional bar stools -Kitchen: Espresso machine, pass-through bar -Bedroom 1: QUEEN -Bedroom 2: QUEEN -Full bathroom with shower/tub -entrance to large deck looking out to fairway...charcoal BBQ (summer use only) --Upstairs: -Loft: DOUBLE futon -Bedroom 3: Two bunk beds (4 Twins) plus two Twins and Twin sleeper sofa, 21" TV/VCR/DVD -Full bathroom with tub/shower Please check out the Interactive Floor Plan available on our website to see the full layout of this home! -Hi Speed Wireless Internet! (connection cannot be guaranteed) Tahoe Donner is a wonderful, mountainous resort community with its own small downhill ski area, a fantastic cross country ski center, a sledding hill, small market/deli and Recreation Center. The Rec Center offers hot tubs, heated pool, fitness center, saunas, health spa, tennis courts, downhill and cross country ski resorts, equestrian center, Golf Club with 18-hole course and driving range, a public restaurant (The Lodge at Tahoe Donner), and a private beach on Donner Lake. 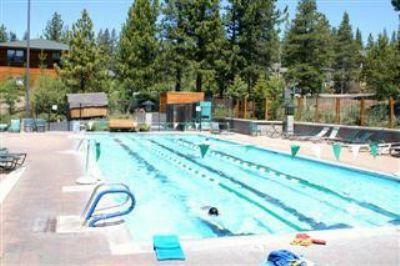 This rental includes access cards for the Tahoe Donner Recreation Center residential amenities. A nominal charge applies for private amenities (Rec Center, Beach Club, Pools, Hot Tubs). For publicly accessible amenities there is a discount price available for pass holders. 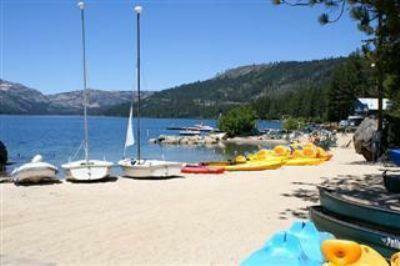 [For more info and schedules visit: www.TahoeDonner.com] Tahoe Donner is conveniently situated at the upper west end of Truckee. Minutes to Historic Downtown Truckee for shopping and restaurants, and 10-30 minutes to ski area resorts including Tahoe Donner, Northstar, Squaw Valley, Alpine Meadows, Sugar Bowl, Soda Spring, Donner Ski Ranch, Boreal and Royal Gorge Cross Country Center and approximately 40 minutes to Lake Tahoe. This home comes complete with full kitchen and all linens and towels. **No Smoking and No Pets** The majority of the guests must be over the age of 25 years old. Please know that reservations cannot be canceled once initial payment is received. We do offer optional travel insurance providing cancellation and medical coverage for only 6.95% of the total reservation cost. If an unforeseen event* prevents you from making your trip, you are covered. *Ask for benefit coverage and exclusion details. Prices are subject to change.